With their unexpected burst of flavour, these grilled tomatoes are sure to be a hit with friends and family alike. Toss tomatoes with marinade. 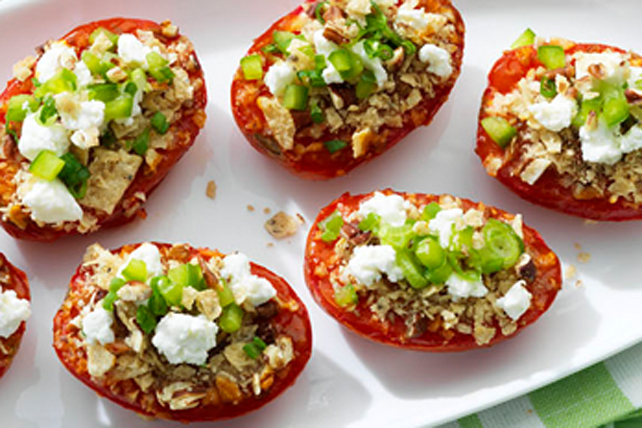 Combine nuts and crushed chips; sprinkle over cut sides of tomatoes. Gently press nut mixture into tomatoes to secure. Grill tomatoes, cut sides up, 5 min. or until heated through. Transfer to platter. Serve over a bed of mixed salad greens, or as a side with grilled steak or chicken.